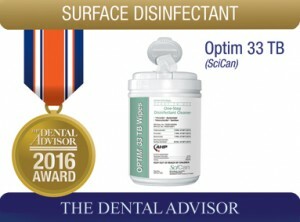 Optim 33TB is a ready-to-use, accelerated hydrogen peroxide (0.5%) one-step, multi-purpose, disinfectant cleaner designed for general cleaning and disinfection of hard, non-porous environmental dental surfaces, dental chairs and stools. It has a non-abrasive formula and virucidal, bactericidal, tuberculocidal and sanitizing properties. It is the only surface disinfectant product recommended for those offices that wish to go “green.” Optim 33TB has an almond scent, biodegrades in water, disinfects a broad spectrum of organisms, and has an approved tuberculocidal contact time of 5 minutes in the US and 1 minute in Canada. It is safe (EPA Toxicity Category 4 – no warnings required). Optim 33TB is available in 32 oz bottles, 1 gallon bottles and in wipes. Dry wipe refills in two sizes are also available for those customers who wish to reuse the pop-up wipe container rather than throwing each can away when empty. Optim 33TB was evaluated by 40 consultants in 2092 uses. It received a 92% rating. Consultants reported that Optim 33TB was pleasant to use because it is non-irritating to eyes and skin. Because the product does not contain chlorine, it does not leave the familiar clean smell of bleach. The almond scent effectively masks the peroxide odor but received mixed reviews. When Optim 33TB is used on surfaces previously cleaned with other types of products, cloudiness or stickiness sometimes develops. Because Optim 33TB is an effective cleaner, it removes residue from previous surface disinfectants and that is the primary cause of stickiness. Pre-cleaning once with soap and water eliminates this effect. Sixty-four percent of consultants reported that Optim 33TB was better than or equivalent to other disinfectant cleaners. Fifty-two percent would switch to Optim 33TB and 72% would recommend it. Clean all surfaces with soap and water before using Optim 33TB to prevent adverse interaction with other disinfectant wipes and possible staining or clouding of surfaces. 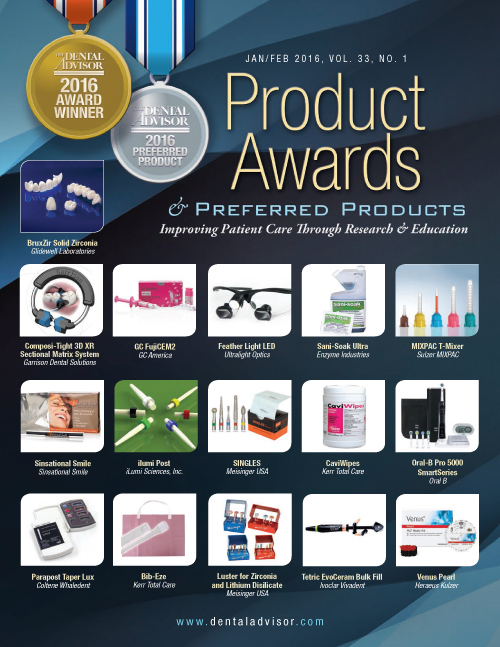 Do not use on aluminum, brass, or copper surfaces.